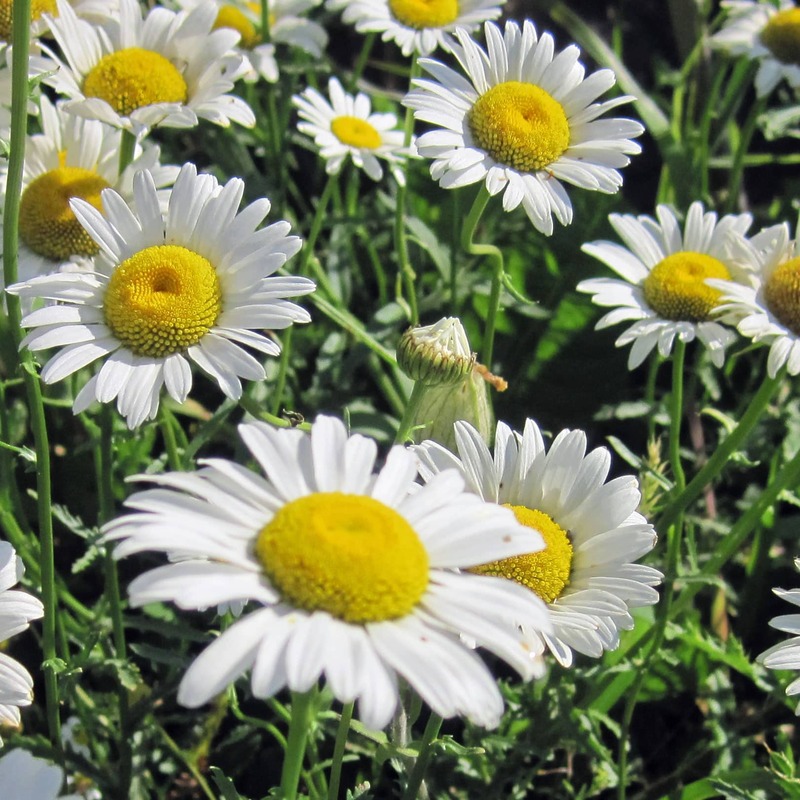 Today's featured plant is the Ox-eye Daisy, Chrysanthemum leucanthemum. 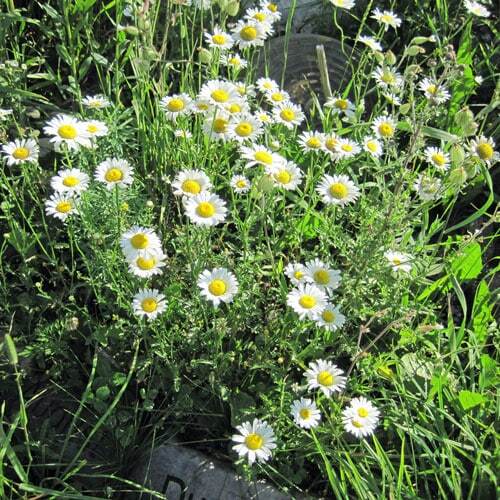 The ox-eye daisy is also known as white daisy, margurite, field daisy, poorland flower, whiteweed and moonpenny. Like the common dandelion, the “flower” head is a composite of many tiny flowers clustered together (disk flowers surrounded by ray flowers). If you click on the image above you can can see this quite clearly on the flowerhead at center left. It grows from 1-3′ tall, depending on conditions, and the flower heads can be somewhat floppy. Leaves are thick, dark green and toothed, and can grow up to 6″ long. They form a basal rosette at the base of the plant, and then alternate up the stem. The plant is a perennial, so it will come back year after year. The roots form a dense mass and can be hard to remove, so it's best to keep this one under control from the start by deadheading before the flowers mature completely and digging up some of the plant as needed to keep it from spreading too far. Depending on which reference you check, ox-eye daisies are either a good nectar source or a poor nectar source. Judging from my garden, they sure seem pretty popular with the butterflies, bees and other insects, as you can tell from the photo at the top of the post with the honeybee sitting on a flowerhead. Ox-eye daisies are not a great forage plant for other animals because of the presence of pyrethrum, a naturally occurring pesticide that gives the leaves a bitter taste. Horses, sheep, and goats will eat ox-eye daisy, but cows and pigs avoid it. (reference) It may impart an “off” taste to the milk of lactating animals if eaten. Young shoots and leaves are edible, but bitter. They may be used sparingly in salads as a bitter herb and digestive tonic. For years I've simply been enjoying the crazy piles of flowers these plants produce around my yard. I figured they must be good for something, as most plants are, but I didn't know what. 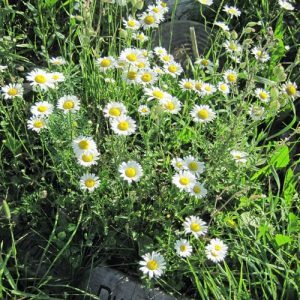 it wasn't until I started reading Herbs Gone Wild that I had my ox-eye daisy epiphany. I read Herbs Gone Wild and the other two books in the series by Diane Kidman (Hair Gone Wild and Beauty Gone Wild). Diane mentions in Herbs Gone Wild that you can use dried ox-eye daisy flowers to make a tea that will clear up sinus congestion for 4 to 6 hours. (1 teaspoon flowers, 1 cup boiling water, steep 10 minutes, sweeten if desired.) You'd better believe I'll be drying some this summer to have on hand for cold and flu season. The whole plant, and especially the flowers, used as a medicinal herb is antispasmodic, antitussive, diaphoretic, diuretic, emmenagogue, tonic, nervine and vulnerary. Constituents include Essential oils, Tannin, Saponins, Mucilag, Bitter Principle and Flavones. It has much of the same properties of Chamomile. The flowers are balsamic and make a medicinal infusion for relieving chronic coughs and for bronchial problems. The herb is used in the treatment of whooping cough, asthma and nervous excitability. The root is used successfully for stopping the night-sweats of pulmonary consumption. Externally, it is used as a medicinal lotion for wounds, bruises, and ulcers. A distilled water made from the flowers is an effective eye lotion in the treatment of conjunctivitis (pink eye). This is just what I needed as I’ve been trying to identify this plant in my yard. I have a tone of them but few dandelions. Thanks for this whole series!